So often did I wonder if the year 1900 was a special year to the Romanovs and Fabergé, like the new millennium was to us in the year 2000. Sure, a turn of a millennium is even more special than the turn of a century, but as most people only experience one of the two, a very special occassion it is, no matter what. Looking at the two Eggs Fabergé made for the year 1900, the Cockerel Egg and the Transsiberian Railroad Egg, one could perhaps say 'yes', as both Eggs are exceptionally large and beautiful, both with moving parts, one with a build-in clock and cockerel, the other with a little train that could move on its own. 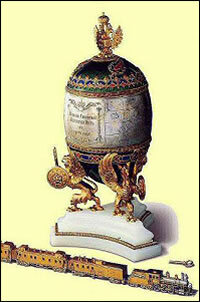 But as with so many things about Fabergé and his Imperial Easter Eggs, we will never know for sure. 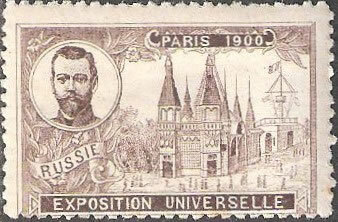 How often did I not sigh and say to myself "if only this Egg could talk ..."
Well known is that 1900 is the year of the Paris Exhibition Universelle (World Fair). Planned many years in advance as the occasion to celebrate the turn of the century and to show the newest, the best and the most beautiful of everything to the world. 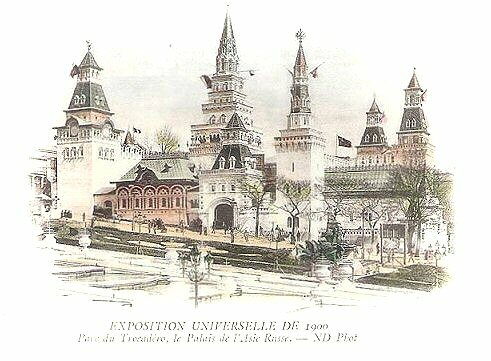 As France's closest ally at the time, Imperial Russia was allotted one of the largest exhibition spaces and Imperial Russia was present with a significant presentation while the Franco-Russian allicance was celebrated exuberantly. Today, the Pont Alexandre III in Paris and the Trinity Bridge in St. Petersburg are two lasting symbols of this alliance. We know from the 1993 book Fabergé: Imperial Jeweller, by Géza von Habsburg and Marina Lopato, (Fabergé and the Paris 1900 Exposition Universelle by Géza von Habsburg, pages 116 - 125) that the 1899 Pansy Egg was exhibited, the 1898 Lily of the Valley Egg and the 1891 Azov Egg and that not all critics were enthusiast of what Fabergé had on show! Some even were very critical! Two more Eggs we know from Artistic Luxury - Fabergé Tiffany Lalique, 2008, 21, (Stephen Harrison, Ducamp and Falino) the 1897 Coronation Egg as well as the 1890 Danish Palaces Egg. 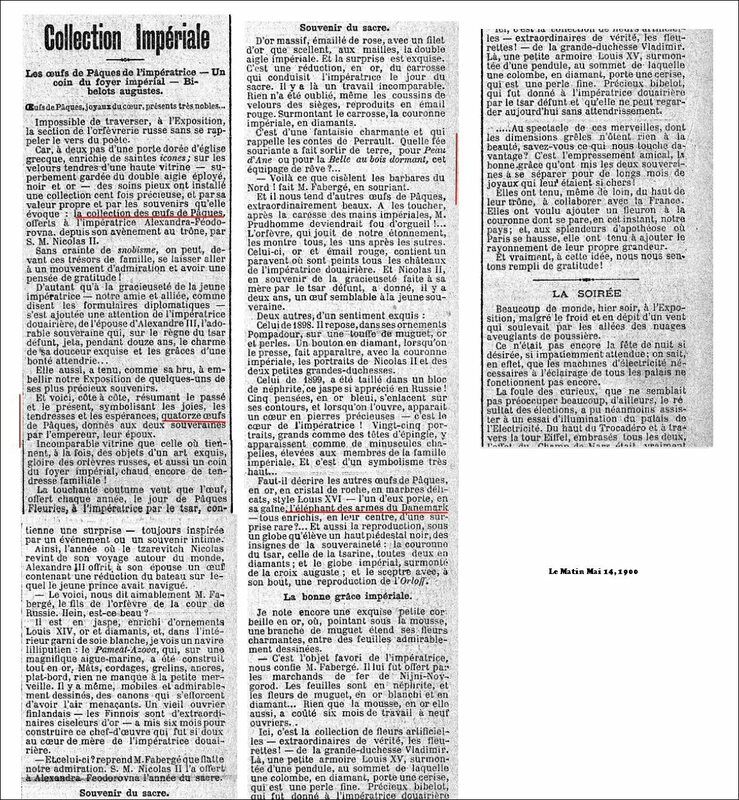 The "eye witness account" of the Fabergé exhibit at the 1900 Paris Exposition Universelle was published in Le Matin, Lundi 14 Mai 1900, Collection Imperiale - Les Oeufs de Pacques de l'Imperatrice. (Click image above to download the article) It gives a new and interesting insight into the Imperial Easter Eggs displayed. He (the reporter) says fourteen (14) eggs were exhibited, which contradicts the number of 40 (Harrison, Stephen, et al. Artistic Luxury – Fabergé Tiffany Lalique, 2008, 21 and 72) and also published in the October, 24, 1900 English language Jewelers' Circular. This likely was an incorrect translation of the French words quatorze (14) and quarante (40). ...and here are, side by side, presenting the past, the present, representing happiness, tenderness and hope, fourteen (14) Easter Eggs, presented to two Empresses, by the Emperor, their husbands. And, isn't this one beautiful? [1891 Memory of Azov Egg] - And this one? 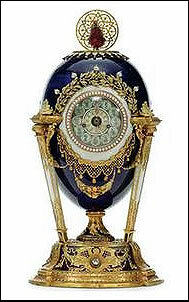 asks Mr. Fabergé ... His Majesty Nicholas II presented it to Alexandra Feodorovna in the year of the coronation [1897 Coronation Egg]. The goldsmith who enjoys our astonishment, is showing them all, one after the other. 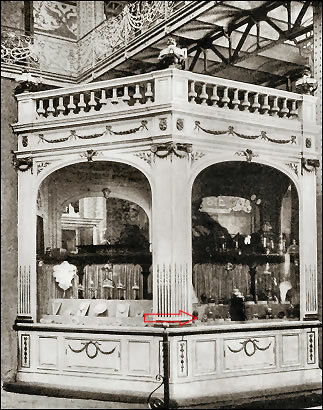 The only one photograph of Fabege's booth on the 1900 Exhibition that I know of, you can see below. Left a general overview of Fabergé's exhibit booth. 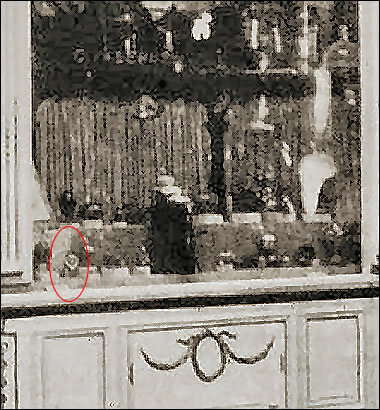 Sadly the photo is not very clear but I imagine I can see the 1899 Pansy Egg heartframe in the right enlargement. What more could we perhaps see if there was a good high resolution pix of the event? We have to wait and see. I am so often surprised that after over a hundred years, new info about the Eggs or in relation to the Eggs keeps surfacing. Great! As more and more newspapers worldwide put their archives online, perhaps one day we will know all fourteen Eggs exhibited. For now we know seven, and that is TWO more than we knew before! It is not known which Fabergé son this was. 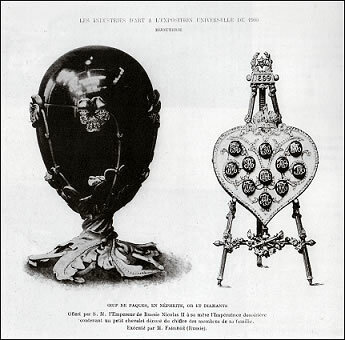 Fabergé had four sons; Eugène, Agathon, Alexander and Nicholas and both Eugène and Agathon were in Paris at the fair in 1900, see 1993 Fabergé: Imperial Jeweller, Géza von Habsburg and Marina Lopato, 63.